I used to live in the apartment complex in your picture. The cottonwood was cool and annoying at the same time. I miss that area a lot. Just isn't the same in the suburbs of NOVA. I can see how they could be annoying. 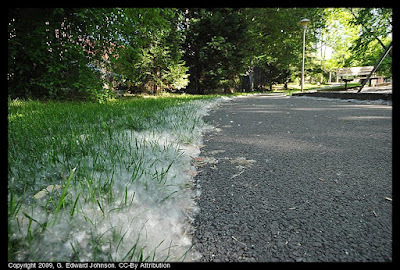 When preping for this post I read that some places have banned cottonwoods because of the fuzz. But, as someone who doesn't have to live with them on a day to day basis, and hasn't experienced them before, this is pretty cool. Thank you for this post. 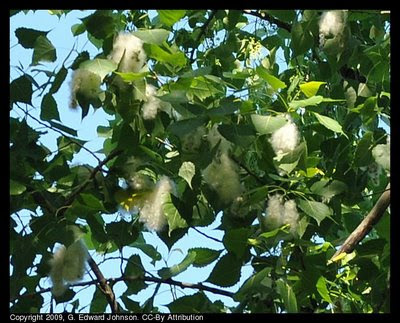 There was a cottonwood tree in the neighbor's yard where I grew up and I loved the soft fluff that came off the tree. 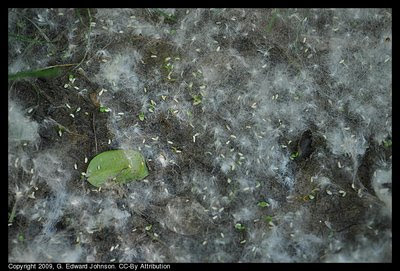 I'm never back in my hometown when the cottonwood seeds are flying around. I'll have to check this tree out now that I know there is one here in Bethesda. I doubt they look very nice right now though, with the rain we've had overnight. We've got a ginkgo in our yard. Now THAT is annoying!